My interest in carnivorous plants started when I discovered an infestation of fungus gnats in my houseplants. I had been using fly paper, insecticidal soap and neem oil in an attempt to control the little buggers, to no avail. I lost many little plant seedlings due to the fungus gnat larvae in the soil I was using (which I suspect were present in the soil when I purchased it). I quickly became engrossed in my research about the fascinating varieties of carnivorous plants, and how they function in nature. Since insects have no problem sucking the sap out of our plants, I am intrigued that there are plants in nature that turn this phenomenon around on the little predators and eat them instead. 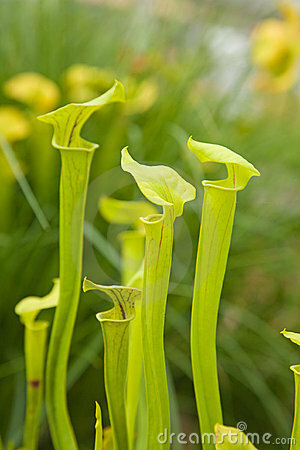 I am also fascinated by the animal-like nature of carnivorous plants. Normally, people view the animal and plant kingdoms as being very separate forms of life. Yet, in nature there are animals that resemble plants; just check out the ocean! To me, sea urchin and barnacles are almost cacti-like. I have seen real life flowers that look like starfish. The carnivorous venus flytrap plants have traps that seem like little reptile mouths. The aptly named cobra lily, a variety of the pitcher plant, really does resemble a cobra. The plant and animal worlds are much more linked than we give them credit for, and carnivorous plants, to me, illustrate and represent this link. During my research, I discovered that adding a layer of sand over the soil in my house plants, which I then covered with a generous layer of cedar moss, would take care of the gnat problem. I have now accumulated a total of ten carnivorous plants, no longer with a purpose of insect control as a top intention, but simply because they are cool little creatures. Hopefully some of them will survive in my care! Contact me below to set up an appointment.